Today marks what would be Charles Darwin’s 207th birthday. We’d like to take this opportunity to celebrate this incredible human and his important scientific discoveries. May we all be inspired by his desire for truth through science and his relentless curiosity to find answers.. There is no better place to study evolution than on islands. Their isolation and defined boundaries create unique circumstances which often result in rare and unusual species. These species evolve over years to best adapt to their habitat. They may be smaller or bigger than their mainland-based relatives depending on the resources available in the environment. Islands truly are ‘laboratories’ for studying natural selection. Darwin’s work focused on the extraordinary wildlife of the Galápagos Archipelago. These days, Galapagos’ plants and animals face a very serious threat – invasive species. 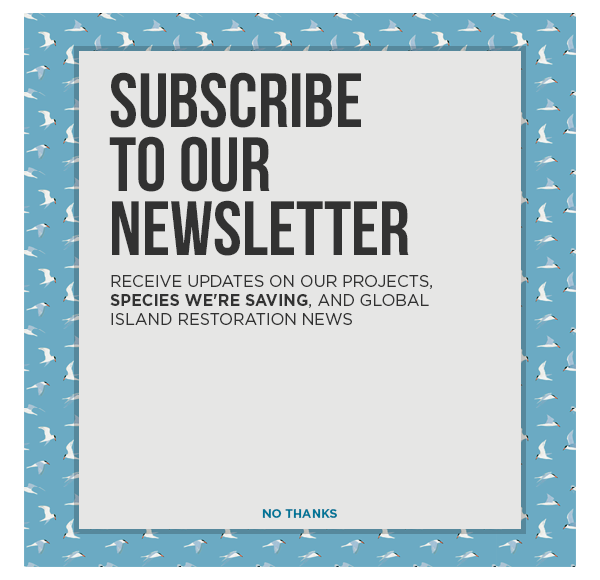 Island Conservation is working with local partners to protect Galápagos’ wildlife by removing invasive species from islands in the archipelago. You can learn more about our work in the Galápagos on Pinzón and Floreana Island here, or in this Radiolab podcast, which dedicated a whole episode to the archipelago. Thank You for Helping Save Cabritos’ Iguanas!